In an interview with the RIA Novosti news agency, Russian Foreign Minister Sergei Lavrov covered Russia’s relations with the U.S. and the EU, the prospects for a Ukrainian settlement, and the new eastern orientation in Russia’s foreign policy. RIR presents highlights from the interview. The minister told news agency RIA Novosti that Moscow views Ukrainian President Petro Poroshenko as the key partner in searching for a way out of the crisis in the Donbass region of eastern Ukraine. “His peace plan and the corresponding initiatives of President Putin have provided the foundation for the Minsk accords, whose strict observance is the key to a viable solution of the current crisis," Lavrov said. According to Lavrov, it will take a long time to reduce tensions in Ukraine. "So far, obviously, we are a long way away from that goal," he said. Answering questions about Russia’s relations with the U.S., Lavrov said that Moscow was open to a dialogue with Washington but will under no circumstances give up its interests. “For our part, we are always open to constructive and honest dialogue with the United States both in bilateral affairs and on the world stage, where our two countries bear a special responsibility for international security and stability,” he said. “The question is, when will Washington be prepared to cooperate on the basis of genuine equality and respect for Russia’s interests, which we are not going to compromise under any circumstances?" According to Lavrov, the U.S. has made unfounded accusations against Russia of violating the INF (Intermediate Range Nuclear Forces) treaty. It has not yet supplied any evidence to support these accusations. He also said that the U.S. was ignoring concerns voiced by the Russian side. “For example, next year, in conflict with the (INF) treatys, the Americans plan to start deploying missile defense launchers in Romania and Poland, which can also be used to launch intermediate range cruise missiles designed to attack various targets, such as the Tomahawk. 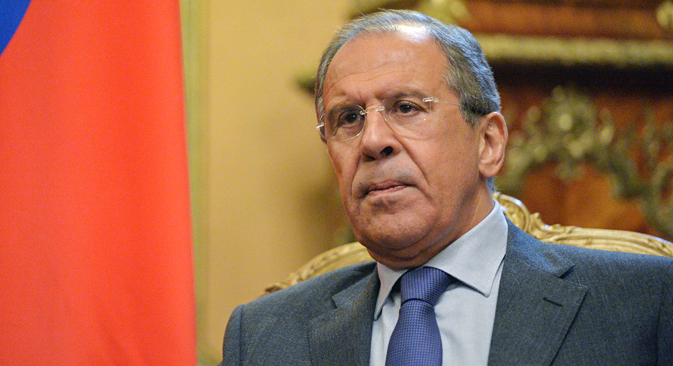 Regretfully, Washington is pretending not to notice Russia’s concerns," Lavrov said. "We would like to warn that at a certain stage of the deployment of the U.S. missile defense system we will have to take adequate measures in order to ensure our own security,” he added. Russia’s relations with NATO are currently going through the most serious crisis since the Cold War, yet at the same time Lavrov claimed Russia is in favor of keeping channels for political dialogue open. Moscow will not initiate the lifting of restrictions on EU food imports which were adopted in response to Western sanctions: Russian-EU relations have reached “a point where goodwill gestures do not lead to the necessary result,” Lavrov said. "We are not going to discuss any criteria for lifting the sanctions. They should be lifted by those who imposed them. Of course, if the EU demonstrates common sense, we will be ready for constructive cooperation on this issue,” he added. Lavrov said that Russia has no intention of changing its course in relations with China since it meets the essential interests of both countries. “These are in every sense mutually beneficial relations, in which there are no seniors or juniors, no leaders and no one being led. The course of Sino-Russian relations has been plotted with consideration for the fundamental interests of the peoples of the two countries and we do not intend to change this,” Lavrov stressed. According to Lavrov, so far there has been no cooperation between Moscow and Washington in the fight against the Islamic State of Iraq and Levant terrorist group: "Washington did not see us as a direct participant in the anti-ISIS coalition, which it was cobbling together according to its own rules and parameters, with only its own interests in mind and without any regard for international law,” he said.